When looking at Fiber laser technology and considering the productivity benefits of cutting two to three times more parts per unit of time, while consuming less than half of the operating costs compared to CO2, it is fairly obvious why Fiber lasers have become so popular. But these benefits are considered tangible potential profits based on performance metrics such as speed and cost of operations. The intangible potential profits are derived from the additional machine capacity that is being created. With the fiber laser cutter you are able to produce two to three times more parts per unit of time, increasing machine capacity and in turn, producing additional parts and revenue not realized prior. Because you are now more cost competitive, there is the added flexibility to expand into industries you were unable to compete in prior to purchasing the fiber laser. Intangible profits are also derived directly from the additional machine capacity. Lower overall costs are realized by not performing maintenance tasks typical of a CO2 laser. Not having to perform maintenance on optics, the beam path bellows and purge system, the vacuum pump etc. frees up more machine capacity. Not having to wait ten minutes every day for the resonator to reach full operating potential is another capacity opportunity gained. Another overlooked benefit is the fact that the beam alignment and the beam size never changes on the Fiber laser, allowing for consistency of cut and repeatability of parameters on a daily basis. Additional machine capacity is increased by not having to spend time tweaking the parameters. With Fiber laser cutting parts are always consistent in cut quality from shift to shift and from day to day. Effectively utilizing the speed benefits from high power fiber lasers takes careful planning and management of all processes. With a two to three time greater throughput and a cost of operation that is half of the CO2 laser, the financial gains can be game changing. The results are a lower cost per part, higher potential profit margins and shorter return on investment. Let’s not forget the added benefit of increased machine capacity now that you are processing normal part volumes much faster, providing the opportunity to take on additional work to further increase your sales revenue. 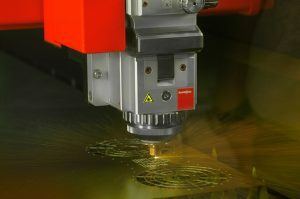 When looking at fiber lasers there are both tangible and intangible profit potentials. When creating cost justifications remember to include both, although the tangibles will already be an eye opener. Be prepared for additional machine capacity and consider expanding into industries that you were unable to compete in prior to owning a Fiber laser cutter. See the Bystronic 10 kW ByStar Fiber in action, plus learn more about Fiber laser technology and Fiber laser cutting machines HERE!